French Impressionist painter Claude Monet loved to dine under the open sky. 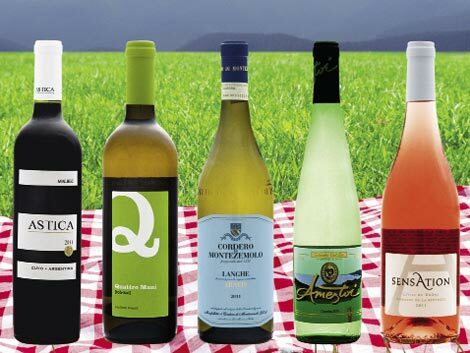 As summer evenings reach their apex, these picnic wines—from effervescent white to velvety rosé to rich red—will cover all the bases should you, too, wish to stage a pastoral escape. Be sure to pack a quality corkscrew and cozy blanket for a great excursion. Produced by family-owned vineyard Bodegas Astica in Argentina, this hand-harvested red is a steal at $6. Its blackberry notes make it a foil for barbecue or an ideal accompaniment to juicy blueberry pie. The Italian Piemonte is the only place in the world where the Arneis grape grows. Smooth and light with a lingering sweetness, this white can be enjoyed with quiche or cucumber and watercress sandwiches. Mediterranean sea breezes lend a characteristic freshness to the wines from San Sebastian, Spain. This lovely white is a step up from vino verde. Its minerality pairs with oysters and grilled chicken. A blend of cinsault, grenache, carignan, and syrah form this rare Côtes du Rhône rosé. Hints of raspberries, strawberries, and white pepper make this an ideal pairing for Cajun-blackened crawfish or grilled meats.